I suspect that all restoration projects follow the same fundamental rules. If you are after perfection, pay an expert to do the work and be prepared to pay a lot. If you are the talented perfectionist, then you already know the time and money it costs to do the job to your standards. But if you are somebody with an old boat because that is what you can afford and you want it to look better without paying professionals to do the work, then you're at the right blog. When I bought my boat in September 2005, and named it "Narrow Escape", I knew it was structurally sound. Cosmetically, the hull looked okay, even capable of being buffed to a bit of a shine. The deck and cabin top were challenged, however. They bore spider webs of gelcoat cracks, mostly in the smooth areas. And they were splotched with caramel-colored epoxy resin that had been poured onto some of the cracked areas in an apparent effort to seal them. The raised nonskid area of the cockpit sole also had a lot of gelcoat cracks, which I thought would pose a problem in trying to fill while still maintaining the nonskid pattern. By the spring of 2007, I finally was ready to tackle the job of refinishing the deck and cabin. There is no way to do that without committing to eventually stripping the deck of all hardware and the cabin of all its port lights (okay, windows) and wood trim. I did it in increments. For instance, the windows stayed in place until I was ready to begin applying the finish. I did not remove the toe rail. It is teak, which hasn't seen any varnish or any other finish in years. When the boat is washed with soap and water the toe rail has a wonderful gray, weathered teak color and it is structurally sound. 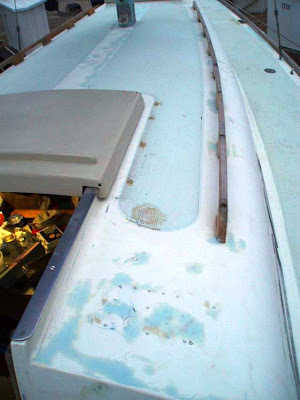 As I was to eventually prove, water had seeped down very few of the one-quarter-inch machine screws that fastened the deck and hull together beneath the toe rail. I didn't like the way the lifeline stanchions were fitted, nor the rear pads of the bow pulpit. The issue was that the deck of the Ericson 30 has a smooth perimeter a couple inches wide, while inboard of that the deck has an aggressive raised nonskid pattern. The design certainly was easier for Ericson's pattern makers to tool. But they could hardly have designed a more leak-prone system. The triangular bases of the two of the three lifeline stanchions on each side of the boat and the rear pads of the pulpit straddled smooth gelcoat and raised nonskid. 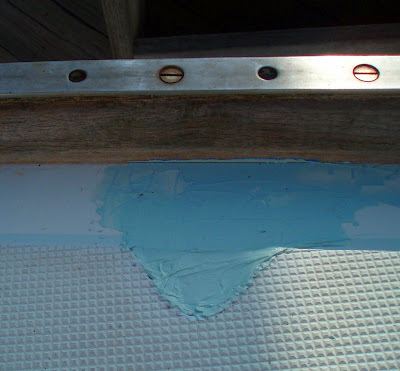 Teak shims were inserted between the smooth perimeter gelcoat area and the bases to provide a flat mounting surface. I decided to grind off the one-eighth-inch of raised non-skid under the pads and then finish with epoxy filler make a flat surface on which to refasten them. But before I could take off the forward two stanchions on each side, I had to remove mohagany planks inside the cabin that covered the underside of the deck. They were secured with screws behind bungs and varnish. It was fairly obvious which bungs had to be removed. I broke the varnish with an appropriately-sized gasket-cutting punch, and then used a drill to remove the bungs. 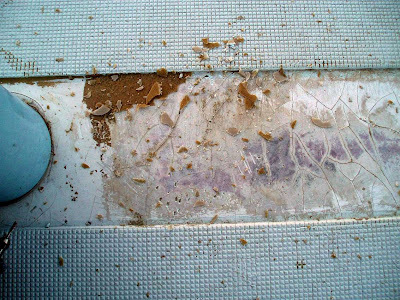 Only one small area of the balsa core of the deck and cabin top was obviously damaged. I previously described fixing a soft area in the cockpit sole with West System epoxy and structural filler. I did the same to a small area of the cabin top to starboard of the companionway slide. Several holes penetrated the structure where some unknown item of equipment had previously been mounted and then removed without sealing the holes properly. I drilled a series of holes into the soft area, but not through the cabin liner below, allowed the area to dry and then pumped it full of thick epoxy filler. In this case, everything was done from the exterior. The Ericson has a full fiberglass liner forming the upper portion of the interior, and it was in excellent condition. Extensive gelcoat cracking required a different approach. Every instruction I've read about repairing gelcoat cracks says the first step is to make the cracks wider and then fill them with epoxy. I used a Dremel tool and a supply of small, fluted grinding bits to turn the hairline cracks into u-shaped cracks able to capture and hold the filler. Late in the process, I discovered that Dremel sells hardened bits for about double the price of the standard bits. But they lasted three or four times longer. Gelcoat is a very hard material. I quickly discovered that none of the cracks penetrated to the balsa core. All were shallow. Those in the nonskid area were only about as deep as the extra thickness of the nonskid itself. That was good news and explained why the deck was solid. One advantage of tackling gelcoat cracks is that it easy to make progress in small increments as time allows. But the other side of that is that such an approach may stretch out the process so long that it seems like it will never be completed. Even worse psychologically was discovering more cracks where I already had opened cracks, filled them and sanded them. These weren't new cracks. I simply had ignored them the first time as I concentrated on larger cracks. I used Interlux Watertite brand epoxy filler to fill the widened cracks. It is a two-part filler with the advantage of a 1:1 mixing ratio. But two serious disadvantages were a pot life of about five minutes and a very hard finish that was difficult to sand. My advice now would be to mix my own filler with West System epoxy and #407 low density filler, which would be much easier to sand.